Holy Trinity Cathedral in New Orleans, Louisiana is having a big celebration this weekend. It’s the oldest Greek Orthodox Church in the Western Hemisphere. This year, it’s 150 years old and local news channel WGNO dedicated a segment with a great historical spot on the church (see video). 150 years goes by in a flash. “Many of us remember when we first came into the church and started worshiping in here, they didn’t have all these beautiful icons. It was just a plain room. Over the years, raising money, added the stained glass windows, added the icons, added all the beautiful things you see in here,” says Barbara Stavis Wolf.. . . .
During the Civil War, New Orleans was a bustling port city, attracting immigrants looking for a better life. “There were Greek’s settling in the city who were merchants, cotton brokers, people that had come over from Greece looking for opportunity in the new world,” says Stavis Wolf. In the 1860’s, without a place to worship, Nicholas Benachi led the call to prayer. “He offered his home to the community members because they didn’t have a church and he said you can come to my house and we’ll have prayer meetings and start to build a church together,” says Stavis Wolf. The congregation expanded and a church was built at 1222 N. Dorgenois. Decades later, with 900 members, the community found their home at Holy Trinity Cathedral at Robert E. Lee Blvd. 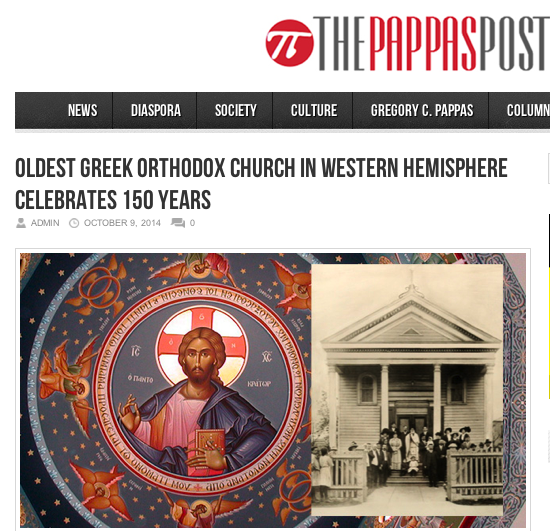 Being the oldest Greek Orthodox Parish in the Americas is reason to celebrate.